Every once and awhile you read about my softness & color shift ratings for certain types or brands of clay that I am working with. Have you ever wondered what they mean and how they work for me? Well, you’re about to find out! There are lots of ways to describe soft. But in order to help you, my readers, here’s a little guide to show you how I measure it. 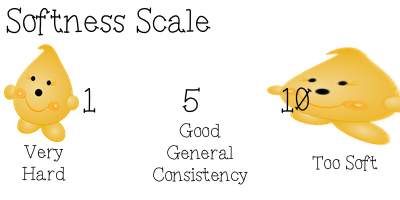 The scale is measured from 1 to 10 with 1 being the hardest and 10 being too soft to work with. If a clay is a “1” then it is absolutely too hard. This kind of a clay will take more than 15 minutes to condition. This is a very frustrating kind of clay, especially for a sculptor. It does tend to hold fine details well, but can be difficult to work into a malleable consistency that a sculptor is used to. If a clay is a “5” then it is a general good consistency: not to hard & not too soft. Perfect for a wide variety of applications. I generally prefer clay in the 4-5 softness range for my sculpting. There are many ways that you can describe a shift in color, but not every color actually shifts after baking. Here’s the scale that I use to help tell you how much shift a color has post baking. You can tell a little bit here by Parker, feel free to use him as a guide. The scale goes from 1 (no shift) to 4 (severe color alteration). 1 = No shift, color is identical to pre-baked samples. 2 = Slight shift, but not enough to warrant any concern. 3 = Moderate shift, it would be wise to take into account this shift when you are creating. 4 = Severe shift, these clays bake to be hardly recognizable from the “packaged” colors. You must take this into account when creating or you will be disappointed in the end. ***Please note that color shift is done per clay color & brand. All samples are baked at 285 degrees fahrenheit for 45 minutes, covered in foil. Changing the temperature, time, & non-covering of clay will change the color shift dramatically.